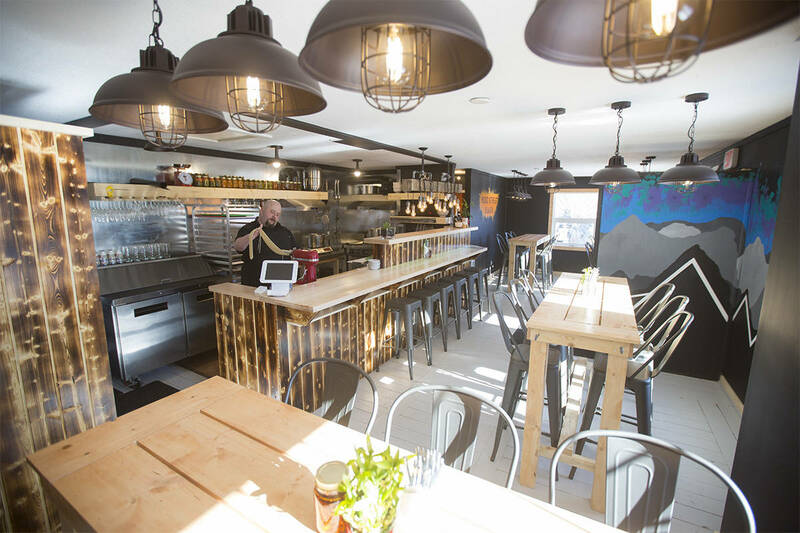 Whitehorse’s newest restaurant opened its doors on March 13. The building on the corner of Wood Street and Third Avenue has been everything from a failed café to a controversial offsale liquor store to an unprofitable pawnshop and more over the years. As of March 13 though, it is home to Wood Street Ramen and the owners are planning to break the curse. “Lots of little things have just worked out so well,” said Troy King, co-owner and chef, about the good luck they’ve had during the last few months of renovating the building. King partnered up with Romi Yu, owner of Tokyo Sushi, to make this ramen house happen and their passion is clear upon entering the building. The interior of the restaurant is unrecognizable from the pawnshop that was in the house last summer. The walls are painted black and covered in art by local artists; the lighting and seats are industrial-style while the five large tables and bar are wooden. The open-concept kitchen is at the front of house, where customers can watch their noodles being cut in front of them. The food concept is simple, said King. Also setting this restaurant apart from others is King’s commitment to buying local ingredients and creating everything fresh in-house, including the ramen noodles. King’s pièce de résistance is his tonkotsu (pronounced tong-coats-zoo) dish. It is made up of house-made wheat noodles, a Japanese pork broth which he boils for 30 hours, locally-sourced pork belly, a soy-marinated egg, leafy greens, shiitake mushrooms, fresh corn-on-the-cob, green onions, fresh herbs, nori and sesame seeds. For those sensitive to certain foods, Wood Street Ramen’s menu caters to most dietary concerns including vegans, vegetarians, and people with gluten and dairy sensitivities. King came to the Yukon three years ago on vacation before travelling back to Asia where he had already spent years training as a chef. He ended up getting a job at Inn on the Lake and falling in love with the Yukon. Wood Street Ramen opened officially on March 13. The hours for the first month are from 11 a.m. to 9 p.m. or until they run out of noodles. Near the end of April they will be receiving their liquor license and will re-evaluate their hours. The owners also plan to redo the building’s exterior and front deck come summer weather.